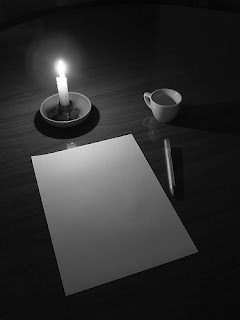 Although the candle is likely now replaced by a desk lamp with an energy-saving bulb, the espresso with an energy drink, and the pen and paper with a laptop, staring at a blank page in the middle of the night has likely been a familiar, and dreaded, experience for college students of any era. How can we help our students avoid this predicament? One way is to integrate low-pressure writing assignments into your course. The "Minute Paper" is a great example. This is likely the most commonly used classroom assessment technique (Angelo & Cross, 1993). Typically the way it is used is to ask students a question (e.g., What was the most important point from lecture today?, What is the main achievement of the first stage of Piaget's theory of cognitive development and what new skills does this achievement support? ), and provide them with one minute to write their answers on a scrap of paper. Some instructors ask students to write their names on the papers and count them towards class participation, but the most common practice is to have the papers submitted anonymously. Typically, the main benefit of this exercise that is discussed is that it allows instructors to quickly assess student understanding. Even in large classes, the Minute Paper allows you to see how many students "got it", and perhaps what details you need to review. This approach is also useful for collecting quick feedback about group work or the use of a new technique. An additional benefit to the Minute Paper is that you are encouraging students to write. Used often, this exercise provides practice in getting ideas down on the page in a limited amount of time. This could help student performance on essay exams and in other written work, as there will be less time spent staring at a blank page and more time writing down ideas. One caveat to the use of the Minute Paper is that if you use them frequently but do not respond to what students have written, students may take them less seriously, thus making the exercise less useful (both for you and for your students). Resource: Angelo, T. A. & Cross, K. P. (1993). Classroom assessment techniques: A handbook for college teachers (2nd ed.). San Francisco: Jossey-Bass.